When it starts, it displays 6-9 for a few dozen iterations, then suddenly jumps to ~1018 and remains throughout the rest of the run. A5 is connected directly to A0 via a 4" jumper cable. Nothing is connected to AREF. If I connect AREF to 5v, the output does not change but by a single digit. If I connect it to ground, it immediately outputs 1023. I'm hoping this is a "do'h" moment here. Can someone please let me know what I'm not doing correctly? Update: This is a legit Arduino Uno R3 board. When I connect A0 directly to 5v+, I get 1023 as expected as the output. For a start, A5 is not a valid pin to do analogWrite to. On a Uno they are marked with the "~" symbol, and are pins: 3, 5, 6, 9, 10, 11. You are then just reading back (close to) 0 or 1023. Second, PWM output is not what you can read back using analogRead. An analogRead reads a voltage level, whereas PWM output is just 0s and 1s interleaved at the PWM frequency, and with a width of the duty cycle. You can see that the most you can write is 255 (not 1023). More information about the ADC (analogRead) at my page about the ADC converter. More information about PWM output at my page about timers. Can someone please let me know what I'm not doing correctly? the analog (output) pins on those chips are not exactly analog: they are pwm output pins. as such, their output is either 0 or 1, nothing in between, with the chance of being 1 equal the duty cycle. that kind of output can be a steady "analog" if you run it through a low pass filter - the simplest would be an rc filter where the r is in serial with the c.
so if you hook th epwm pin up to a rc filter and adc the output of that rc filter, you will get a real "analog". Your program is correct and I suspect the error is in the hardware. Arduino uses its internal timer and creates a high frequency PWM on the corresponding pin upon a analogueWrite() is called. Here what we should notice is the DC switching in the appropriate pin is not noticeable in most cases. (If you give it to an LED you can adjust its brightness). But what you have done now is not correct. 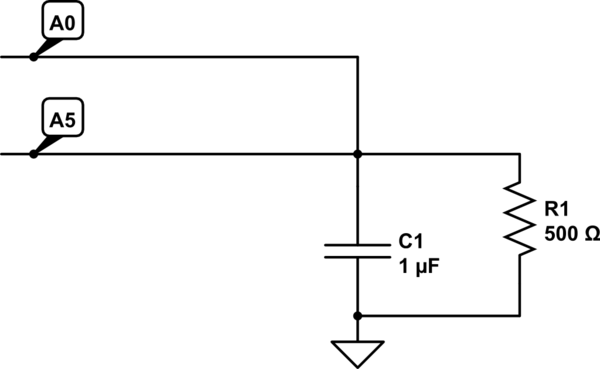 Since there is no current flowing in the pin there will not be a analogue voltage actuality. It is 5V and 0V switching in a high frequency. Those are the values which the A0 pin will see. So try fixing a capacitor between the pin and the ground. and a 1k resistor to create a slight current flow to stabilize the voltage. then let us know your readings. Not the answer you're looking for? Browse other questions tagged arduino-uno analogread analogwrite or ask your own question.